Continuum Partners/East West Partners were tapped officially today to redevelop Denver’s historic Union Station. The publicly supported construction project will be the city’s largest since Denver International Airport and will create the hub for metro Denver’s $4.7 billion FasTracks transit network. The completion of all transportation and street-level improvements by 2011, which includes light rail, commuter rail and the regional bus system. The complete underground construction of commuter rail and portions of the regional bus system. 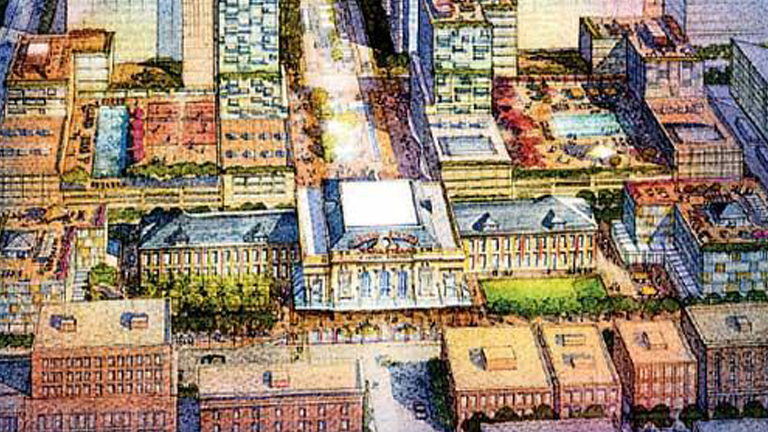 The integration of private development, such as shops and restaurants, with public transportation, and the integration of public spaces and pedestrian-friendly connections with the surrounding historic neighborhood. The construction of 1.8 million square feet of development over nine years supported by a reasonable financing plan. The overall cost is $75 million less than the competing proposal. A commitment to involve small businesses in at least 15 percent of the project’s predevelopment work. A design that complements the character of Denver’s historic LoDo neighborhood. The Continuum/East West design calls for 730,000 square feet of office space and 557 residential units. A 678,000- square-foot retail component would feature a grocery store and a large-format retailer, along with boutiques, restaurants and bars. The plan also calls for burying bus and commuter-rail lines next to the station, but would light-rail lines at street level about two blocks to the west. In a memo to Mayor John Hickenlooper, top RTD and Denver officials said the Continuum/ East West plan would have “less of a negative impact” on transit ridership than the proposal of the other finalist, Union Station Partners, led by real-estate developer Cherokee Investment Partners. The Continuum/East West plan “will tend to reinforce the distinctive character of individual buildings consistent with the surrounding neighborhoods,” the memo continued. The memo came from Denver planning chief Peter Park, Hickenlooper aide Diane Barrett and Regional Transportation District planning director Liz Rao. In contrast, the rival Union Station Partners plan to develop “large buildings of uniform design … is not allowed within the adopted zoning for the site, nor is it in keeping with the varied architecture that is characteristic of Lower Downtown and the Commons neighborhood.” That team’s proposal included high-rise structures of up to 45 stories. A group of real-estate and financial experts who have been advising Union Station’s owners unanimously approved a recommendation to move forward with Continuum/ East West in “exclusive contract negotiations,” according to an e-mail that circulated Tuesday. Those negotiations are designed to settle on precise financial and development details for the Union Station remake. Longtime LoDo developer Dana Crawford, a member of the advisory committee, sided with her fellow committee members, even though she recently voted to endorse the Union Station Partners proposal through Friends of Union Station. The memo to Hickenlooper, obtained by The Denver Post, said the city’s urban-design team believes the Continuum/East West plan is preferable to that of Union Station Partners. Park, Rao and Barrett – key members of the owners’ negotiating team – huddled Tuesday with about 10 other members of the group to review final financial details provided by both teams of bidders. Development of all transit, public space, retail, office and residential construction on the 19.5-acre Union Station site is expected to be worth $1.5 billion when it is completed. The Continuum plan “does more to extend and encourage Denver’s commitment to adding life on the streets,” the memo said. With its underground station, Union Station Partners would get light-rail riders closer to the depot and a transfer to commuter rail than Continuum/East West, but RTD said the Continuum group compensates for that disadvantage by extending the 16th Street Mall shuttle, and a second proposed downtown shuttle, two blocks to the street-level rail platform. Staff writer Jeffrey Leib can be reached at 303-954-1645 or jleib@denverpost.com.